Are you looking for an easy way to get around in CompuServe? CompuServe Information Manager (CIM) is a new interface for CompuServe that makes it easy—even fun—to navigate through this popular online service. CIM uses CompuServe's new Host-Micro Interface (HMI) to make communications more reliable and efficient. The original command line interface transmits menus, prompts, and user replies in ASCII and reserves the error-correcting protocols for down- and uploading files. Because automated scripts and interface programs depend on accurate responses, it's common for them to lock up when the original interface's ASCII commands and prompts are garbled by line noise. This shouldn't be a problem with HMI, because if a command or prompt isn't received perfectly, HMI automatically sends it again. With CIM, navigation is easy and fun. With the command line interface, you might start at an opening menu and make a series of selections until you reach your destination. When you do this with CIM, each selection brings up a new window with a new menu list. The previous windows remain onscreen so you can select the appropriate window and easily move back and forth through the levels. With both the original interface and CIM, you can type GO and a keyword to move directly to a specific location. CIM automates this process by letting you save these locations to a Favorite Places menu. You can also find areas of interest by selecting Find from the pull-down Service menu. Type in a keyword and you'll see a list of CompuServe services that are related to your chosen topic. To search the forum libraries, you select your search parameters and click on the library section you want to search. A window with a menu of files will open with the entries that qualify. You can scroll forward and backward through the selections and click on a file. Another window will open, this time with the file's title (which usually functions as a short description) and five buttons: Next, Abstract or View, Retrieve, Mark, and Cancel. While you can download GIF files or view them online (viewing is no faster than downloading), you can't do both. If you decide you like a GIF file after you've viewed part of it, you'll have to start all over again to download it. CIM automates a number of other CompuServe areas, including messages, mail, stock quotes, CB Simulator, and Weather. In addition, CIM comes with an excellent 300-page manual that also provides an introduction to CompuServe's many services. 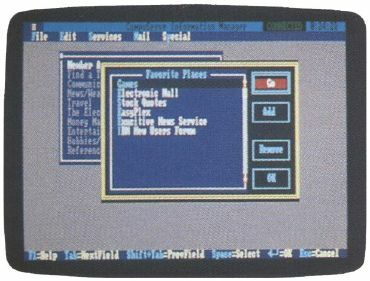 CompuServe has said that the original interface will still be available for members who use automated scripting programs, but the days of the command line interface are numbered. HMI is a great leap forward for making CompuServe easy to use, and CompuServe Information Manager is an excellent—and attractively priced—way to use this powerful telecommunications service.